When going to restaurants, children will not always enjoy the same food that adults eat, and they are more into the visual image of the dish. If a food looks appealing for their age, then they will most likely eat that even without knowing what it is. There are even food establishments that have a separate food menu intended for children to help them decide for themselves on what to eat. This a good habit since it teaches children to be independent. For food establishment owners and managers who are not using a separate menu for kids, then you should start using one now. If you don’t know how to start making one, you can check out the designs that we have on our website. 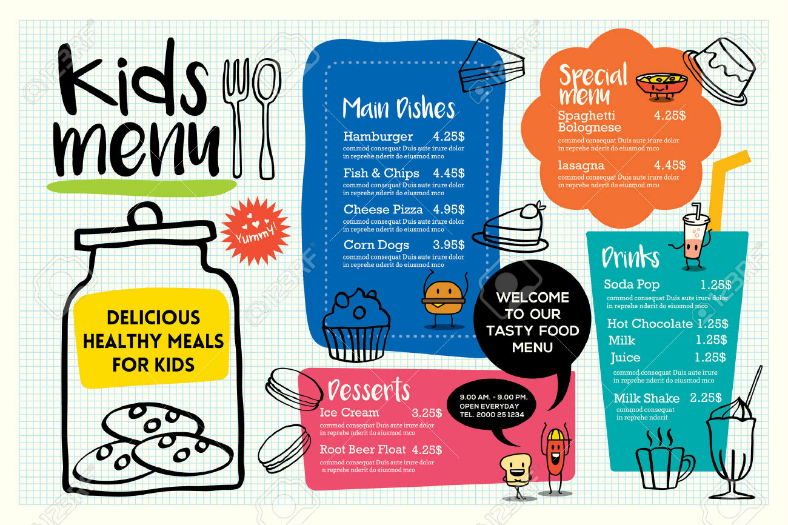 These menu designs are attractive enough to encourage children to read it, and with the dishes and drinks to choose from. Children will be able to make a decision without confusing themselves or the adults with them. For a simple yet artistic approach to kid’s food menus, this one is a good choice. This single-page modern menu design is enough to contain the list of food and drinks available, as well as the additional features to add to the design’s level of appeal. Above is a fun-filled food menu that shows a group of animals celebrating a party. Because of this illustration, this design can also be ideal for use as a party menu. The prices may mean that the guests still need to pay for their food (which is unlikely), or it could also be for decorative purposes only. 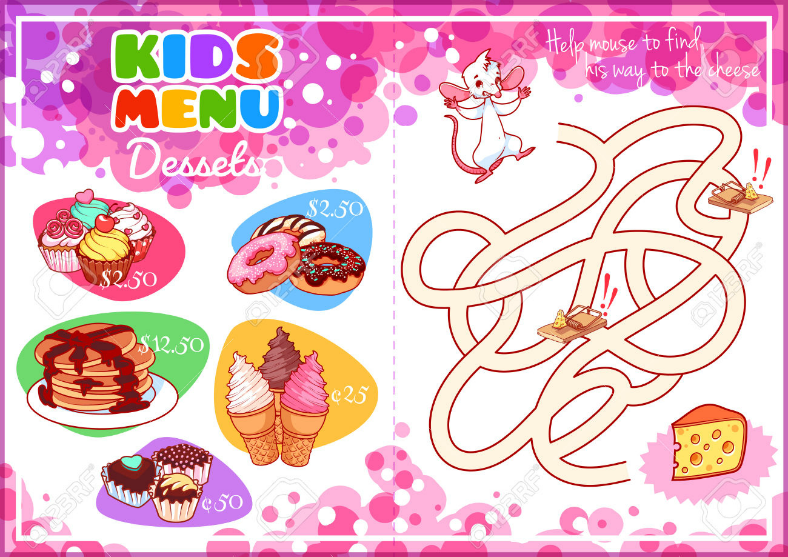 To prevent children from getting confused on what to order, the choices on this menu are arranged according to beverages, sweets, and the main dish. 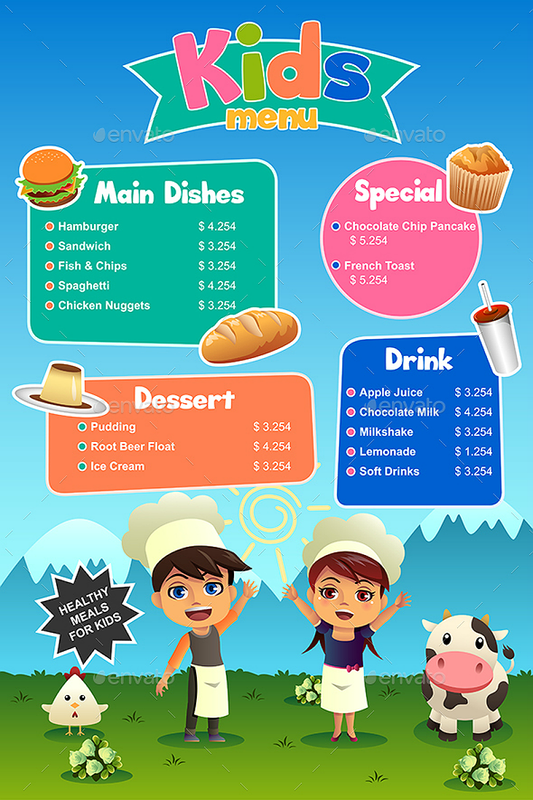 This menu design makes use of a lot of colors that are very appealing to children’s eyes and are sure to grab their attention. The left half of the design has the name of the establishment and their logo, and is used to welcome the children to the dishes that they are serving. 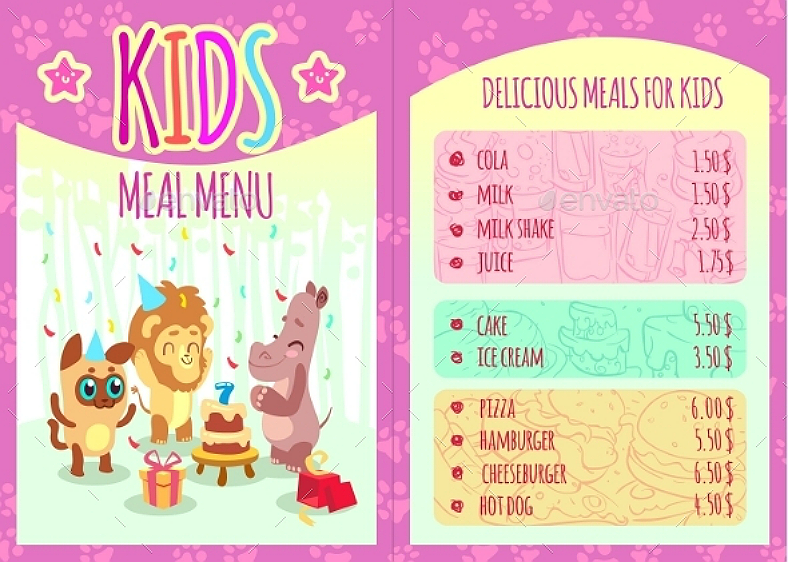 The right half of the menu design is where you can find the food and drinks that are available, and these are also arranged in different-colored backgrounds to make the selection easier for kids. Chalkboards remind us of school. Even though most kids in today’s generation were not able to experience being taught using chalkboards, they will still be able to learn about this through television shows and personal experiences shared by parents and other grown-ups. 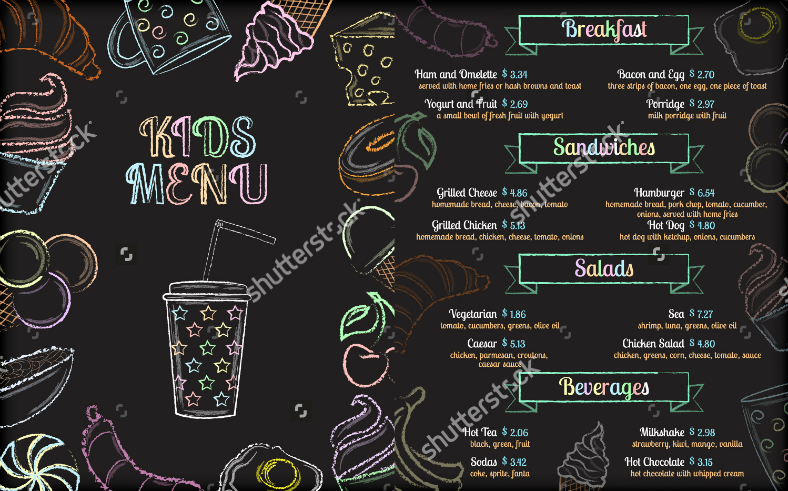 This chalkboard-inspired menu design for kids uses various-colored chalk to make it appear both vintage-looking, and also creative enough to attract attention from children. This minimalist menu design is straightforward and does not require any other features. This design relies heavily on the bright and vibrant colors used to make it appealing, and it also maximizes its use of white space to make the menu organized. These menu designs break away from the traditional menus that are only used for selecting your food and beverage. Unlike most menus that are returned to the waiter after the customer makes their order, this one is given and kept by the children. 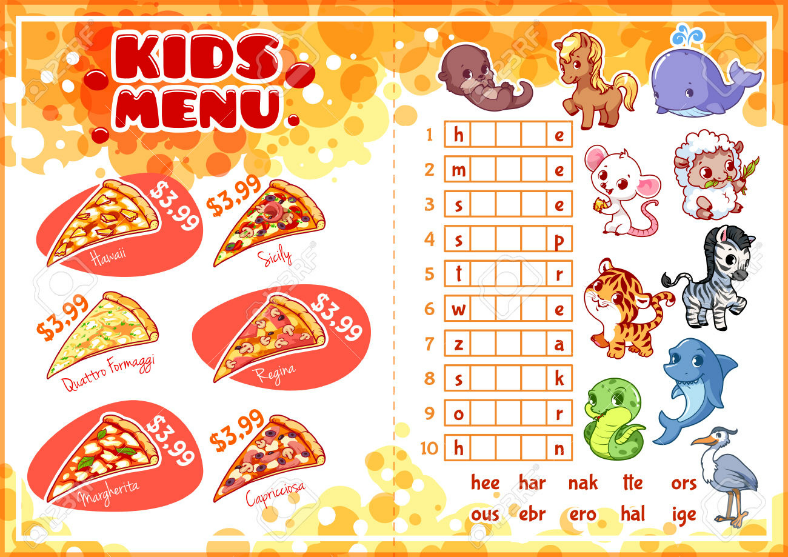 These menu designs are very useful to keep the children busy and entertained while waiting for their food and beverage to be served. This menu design embraces simplicity and also appear to be hand drawn, and the food and the characters are inspired by actual children’s drawings. 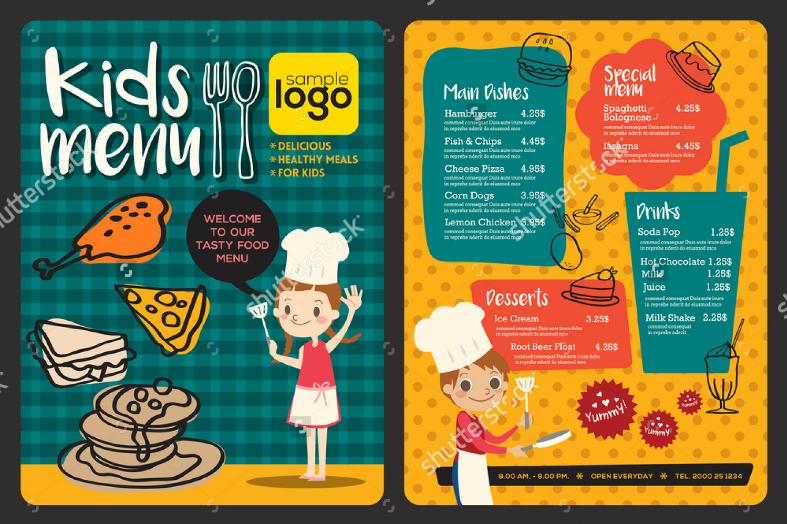 An advantage of having these illustrations is that it is easily relatable to children, who are the main customers who will be using these food menus. If you are artistic and creative enough, you may also use blank menu designs and start from scratch. 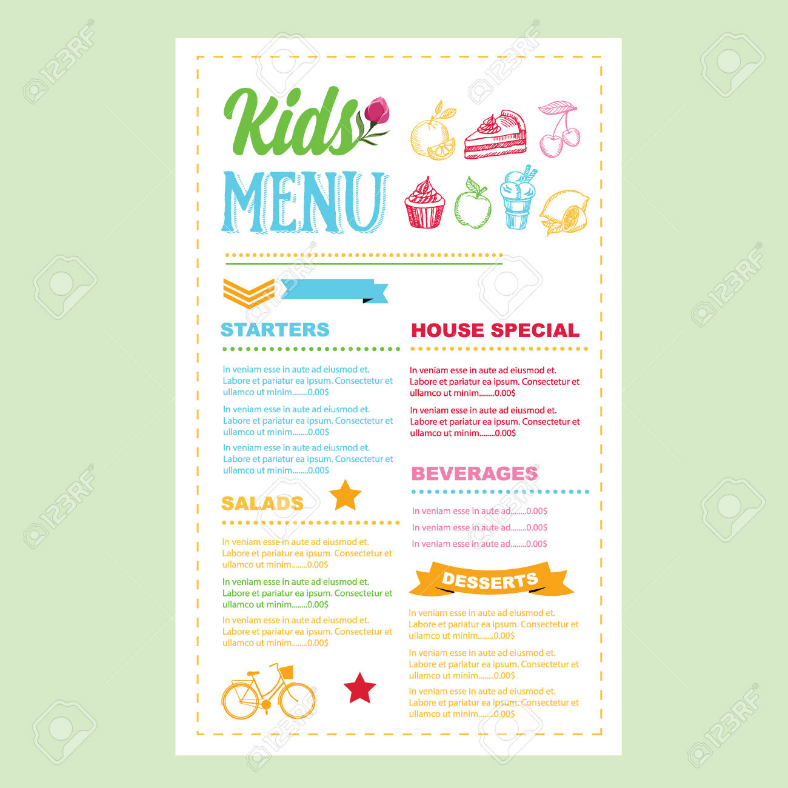 Whether you are handling a small time food business or a big one, these menu designs will be very useful for you to help your customers’ children decide on what to eat and drink. Use cute and colorful food illustrations and your menu is sure to grab children’s attention and make them want to read it. These food menu designs were taken from multiple reliable websites that deliver quality samples and we have collected them on our website for your convenience. These designs can be downloaded with a single click of a button, and they can be yours for a price so reasonable, that you are actually getting more than what you’re paying for. So what’s keeping you? Download your own food menu design now, and you may even want to go the extra mile by giving away food coupons to your customers to help increase your business’ reputation.